Drop-off will be held for 2 days! We will be using our highlighting system to divide you into two smaller “drop-off” groups. Please refer to the chart at the bottom of the page, then check-out our calendar to find your specific drop-off day. Drop-off will be August 14th & 15th from 8:30am to 6:00pm. Starting August 12th, we will not have the opportunity to check email or check voice mails until very late. The best way to contact us after setup has begun is to call Avorie at 273-8399 or Lyle at 396-0526. What should I expect at drop-off? Check-in at the registration table found in the entrance to the store (look for signs). Your participation fee will be deducted from your final earnings. So no need to bring cash. 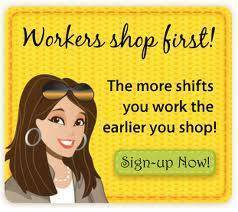 You’ll be given the opportunity to sign-up for any remaining work shifts at this time. You will be able to place and pick-up barcode orders at this time (NOTE: allow extra time to attach your barcodes. The time will be relative to the number of items you bring). Your items will go through a quality control check point. Pick-up your private sale wristband at the registration table after you place everything on the sales floor. Take promotional materials to share within your circle of friends and family. You’re our best form of advertising spread the word! Check-in is not complete until you put your items away.Anything left at the registration desk will NOT be put on the sales floor so make sure you allow enough time to put EVERYTHING in its APPROPRIATE place. THANKS!! All consignors must highlight their tags if you plan to pick-up your unsold items. Use the chart below to find which color of highlighter to use. 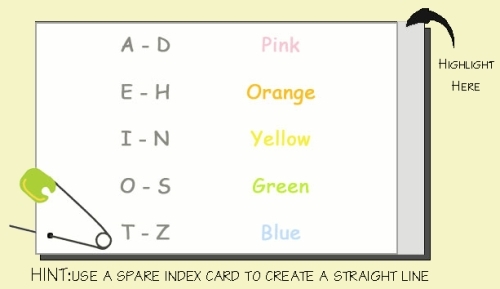 Example: If your consignor number begins with the letter “M” then you would use a yellow highlighter creating a band of color down the right side of each index card (notice the shaded area). Any unsold items left after 6:00pm on Tuesday, August 22nd, will be donated to worthy charities.